303 Products are formulated to offer protection and extend the life of all types of materials, natural and synthetic. 303 Fabric Guard is designed to keep your material looking and performing like new! It not only strengthens your material, but is also increases its water repellency. In addition to this, the guard works great against preventing mold and mildew. 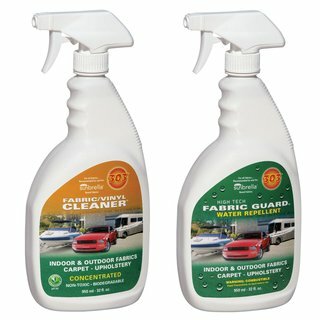 303 Fabric Guard can help your fabric maintain its color over time while still allowing the material to stay breathable. Another added benefit of the 303 Fabric Guard is that it greatly increases your material's stain resistance. This fabric guard is safe for both natural and synthetic fibers. It is sold in a 32 oz bottle. 303 Multi Surface Cleaner is made to be used on any and all water safe materials or surfaces! It provides the ultimate cleaning power available while leaving behind no residue. This Multi Surface Cleaner is one of the best and safest ways to rejuvenate your surfaces, whatever they may be. We recommend 303 Multi Surface Cleaner for our boat covers and Bimini tops, but it is also made to clean anything in your boat, car, or any other places where you have vinyl, fabric's, or surfaces in need of a good cleaning. This cleaner is highly recommended for areas such as consoles, rugs, carpet, awnings, marine interiors, upholstery, and more. 303 Multi Surface Cleaner contains no harsh chemicals, caustics, or acids. This cleaner is sold in a 32 oz bottle.